Cheshmashahi; is suituated on the foothills of Zabarwan range, the garden has a spring known for its medicinal properties. The garden area is surrounded by pine trees and myriad flora. Nishat Bagh; A stone channel for running water in the center has lined fountains that gush water droplets on all sides .Largest and the most visited Mughal garden ,offers spellbinding view of the Dal lake ,old city and Zabarwan hills . Pari Mahal; [place of fairy],3km ahead of Cheshmashahi, was a school of astrology build by elder son of Shah Jahan,prince Dara Shukho, was interested in stars and Sufis. You can also visit ..Harwan Gardens, Zabarwan Park . 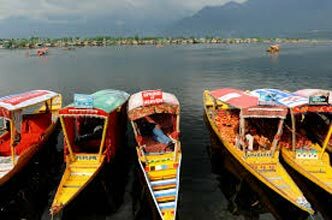 Stay overnight in Deluxe Houseboat , Srinagar. After breakfast drive to Gulmarg (Meadow of Flowers) 2730 Mts. above sea level. The distance of 60 kms will be covered in about 2 hrs. Gulmarg has one of the best Ski slopes in the world and highest golf course of the world with 18 holes. One can also have the view of Nanga Parbhat if weather permits. The view enroute from Tangmarg to Gulmarg is fascinating. One can also have a short trek upto Khilangmarg which can be covered in about 3 to 4 hrs. Chair Lifts for mountain ride are also available. In evening time drive back to Srinagar,Overnight at Gulmarg in Hotel. Pahalgam is a fascinating valley where Lidder river flows nearby astounding mountains .Roaring Lidder river flows through the valley, it rises from the Kolohoi glaciers sufficed by the water of Sheeshnag and Tarsar and finally joins the Jhelum. Pahalgam has an amazing golf course. Trout fishing in Lader river is quit popular sport in pahalgam best season for fishing is April to September. Visit Betab valley. spot at a walk able distance famous for many film shootings. Ponies can be hired to this stream and forest bound valley. Aru;..is a resort village, 14km from pahalgam with motorable road. From here a famous trek via Lidder what leads to the Kolohoi Glaciers 36km at an altitude of 3400mtrs. The restaurants at the main market and bus stand area provides all kind of meals continental and Indian delicacies as per the order of the guests. Late evening drive back to Srinagar. Overnight in Hotel . After Breakfast transfer to Srinagar airport to connect flight for onward destination. Dzire,Tavera, Tempo Traveler as per specific program.